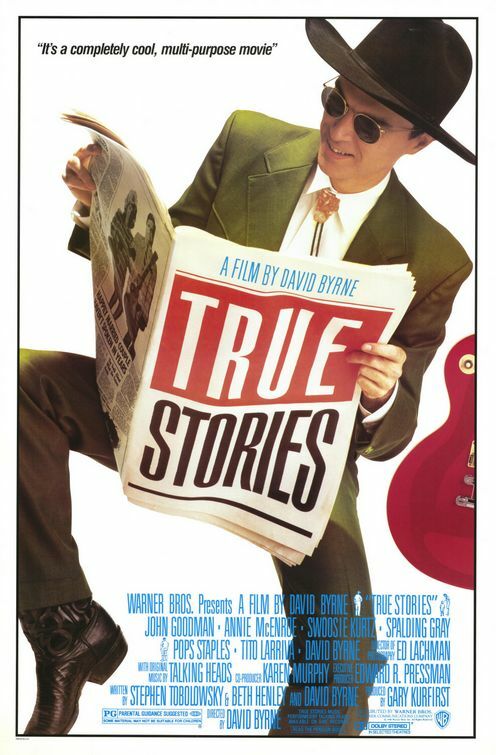 A visitor (David Byrne) to a small Texan town tells stories about its strange citizens — including a lonely bachelor (John Goodman), a compulsive liar (Jo Harvey Allen), and a woman who never gets out of bed (Swoosie Kurtz). This directorial debut by Scottish musician David Byrne has “eccentric” written all over it, in bold strokes. Unfortunately, it tries so hard to convey the zaniness of its “average” small town characters that it falls flat again and again. Byrne apparently based his ensemble tale on oddballs he read about in tabloid magazines — but their inherent quirkiness doesn’t necessarily lead to amusement, and we don’t spend nearly enough time with any of them to begin to care about their lives. The most interesting characters in the movie — John Goodman as a lonely bachelor, and Swoosie Kurtz as a woman who never gets out of bed — could have been the basis for a more interesting comedy, but this opportunity was lost. The soundtrack by the Talking Heads is what would ostensibly draw one to this film; however, for some reason, their songs are almost always sung by actors rather than the band itself. The most enjoyable musical number in the movie occurs when Kurtz is lying in bed watching television, and a Talking Heads music video comes on the screen — this is when we finally understand the zaniness underlying Byrne’s sensibility as a musician, and we immediately want to hear more. The one exception to this rule is when Goodman sings “People Like Us” during the town’s sesquicentennial celebration; he’s got a surprisingly fine voice, and is a joy to listen to. Yes, simply for its status as a cult favorite. However, I can’t really recommend this film for anyone other than Talking Heads fans. A once-must, as a delightfully eccentric cult item. I take a different view from the assessment given – even though I’m not particularly a Talking Heads fan (outside of an occasional song here and there). I sort of wish the film were better and tougher (particularly in its last half-hour) because it has a lot of good stuff in it. To me, the film comes off as a brushstroke of cynicism; it’s a critique of modern American society (specifically, the southern areas) but its approach is laconic – as if there’s a concern that being more incisive might turn people off. The film takes swipes here and there at modern life but it’s gentle about it. It appears to be a film about the difference between people with simple needs and those who get caught up in a progressively complicated world that intrudes on them. The film opens with the reminder that, from America’s earliest days, progress has always been at odds with what people need to be happy. The screenplay credit is shared by Byrne, actor Stephen Tobolowsky and playwright Beth Henley. Wikipedia tells us that Byrne met the other two at a screening of ‘Stop Making Sense’. They talked, Tobolowsky and Henley were hired to write a script, turned it in, and then didn’t hear from Byrne for a year. We’re told that, in that time, Byrne had removed just about everything “but a few lines” from the script – but that doesn’t make sense, particularly in Henley’s case. Anyone familiar with her work (i.e., ‘Crimes of the Heart’, ‘Miss Firecracker’) can hear Henley’s writing deeply embedded in (especially) the female characters. The Lying Woman, in particular, is a memorable hoot (“I wrote ‘Billie Jean’ – and half of Elvis’ songs.”). Aside from its engaging visual sense (with its very colorful production design), ‘TS’ holds fun performances by its character-actor cast. Goodman, Allen, Kurtz, Annie McEnroe and Spalding Gray (as the envied couple who – hilariously – don’t talk to each other at home) and Alix Elias (as The Cute Woman) are all perfectly hitched to the film’s tone. Those are some scary lyrics.